Bible Restoration is not a new concept. Family bibles are passed down to the next generation every day, and with each pass, the bible becomes more and more fragile. 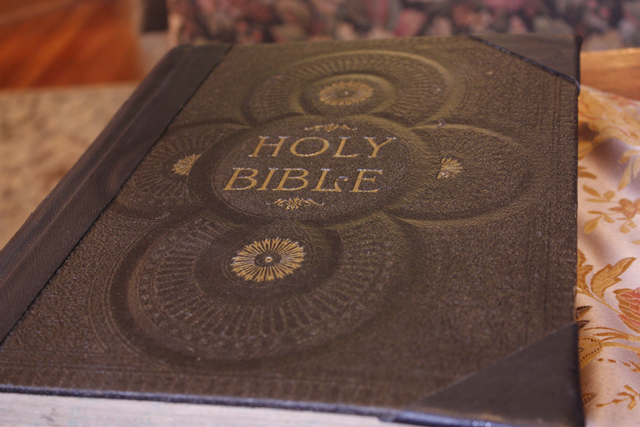 This Bible has been in our family for only four generations. Although it held many loose papers regarding the family (death notices, WWI military papers, and a bible page from another bible of births/deaths) the Family Sheets included in this antiquated bible were not filled in. This, however, did not lessen its value to the family, for it is still a treasured family heirloom. For this reason, the two hundred plus dollars to restore it to its grandeur, was worth the price. 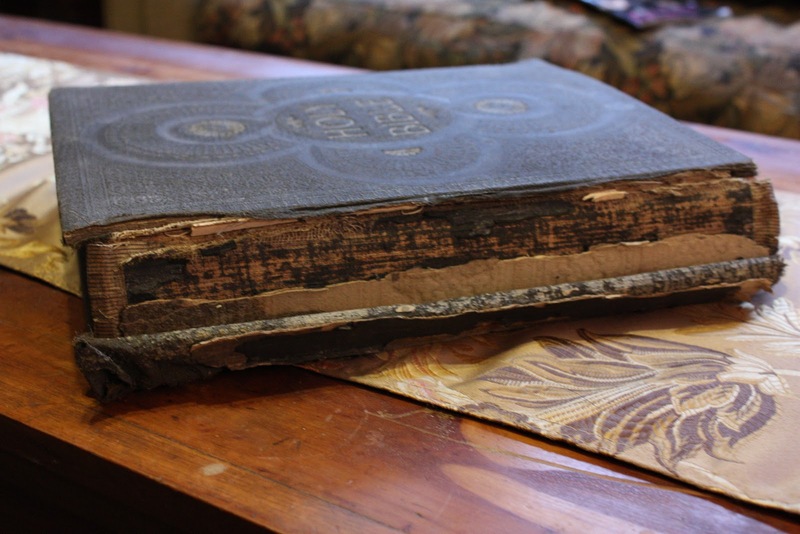 Family Bible Restoration includes page and binding reconstruction. Reconditioning of the covers and spine, by using all original components, preserves authenticity. Although public libraries mend their books with a hot glue gun and book binding tape, they do not provide this as a service to the public. Their book repair techniques are more utilitarian than beautiful. Torn and brittle pages can also be restored and reintegrated in the book. A 4-6 week turn around is normal. The process is slow, as the bible is restored one page at a time, giving each one special attention. $200- $400. Because Victorian Bibles were so popular around the turn of the last century, they are generally not rare items and so do not usually hold significant intrinsic value. Nevertheless, owners of such family heirlooms understandably want to preserve these fascinating books for future generations. 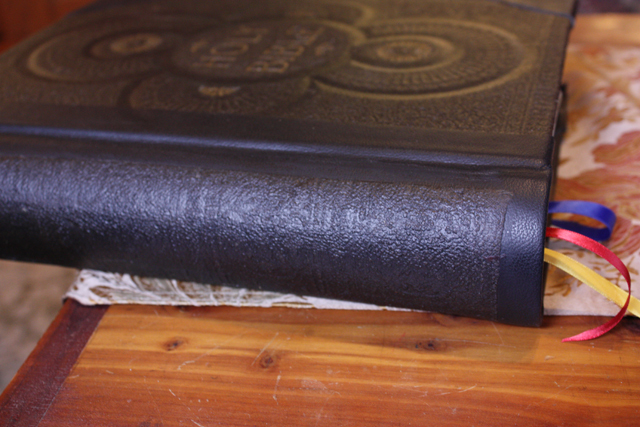 Where to Go for Bible Restoration? 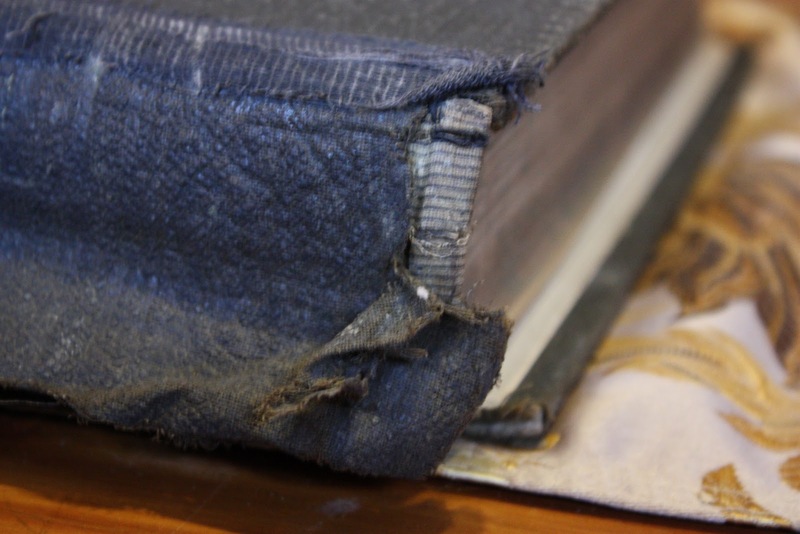 If you want your bible restored (vs. repaired) find a local book bindery that specializes in the restoration of old books. This is not the time to go to a novice. Be sure to see some of their work. In Kansas City, I only work with Engle Bindery, a “quality custom hand bindery” founded in 1885 by Henry Engle, a German immigrant who did miracles with binding techniques. Engle learned his craft in Germany, and migrated to Reading PA. He moved to Kansas City by 1883. He and his six sons worked at the Bindery. Son Charles worked at the Bindery until the age of 80 in 1954, passing the trade to the new owners Oscar and Esther Fuch and later to James and Frances Porter. One visit to this bindery and you will know that all the old techniques are still being implemented. Engle Bindery is a museum itself in the use and restoration of binding machinery. This bindery has been at its present location, 322 SW Blvd, since 1957. The fourth owners John P and Betty L. Haynie expanded the production after 1981 to include automatic foil stamping, die cutting and embossing. The lower floor is used as a press room and the book binding operations are done on the 2nd floor. · Store the Bible where it isn't exposed to high heat or humidity (attic, basement, or garage are all bad areas). Very interesting. Learned stuff. Thanx!! Interesting reading, and timely for me. I was just thinking about how to restore bibles as the one in our family is in need of restoration. Thanks for the info.